I arrived on the Island yesterday for the 2008 Isle of Man TT and Phil Plater and Simon Betney from Dunlop Tyres were kind enough to give me a lift from the airport to my hotel. Good to see them since they’re not so heavily involved in the British Superbike these days. Inevitably we talked a bit about racing but the best discussion was them talking about what coffee to buy. Simon Apparently it’s a choice between Fair Trade and American! Now British Superbike has the one-make tyre rule, I’m looking forward to being at a race meeting where there’s a real tyre war because, believe me there’s some serious bragging rights up for grabs at this year’s Isle of Man TT between Dunlop and Pirelli. The Isle of Man TT paddock looks even more impressive than last year, in fact the whole Nobles Park area has been redeveloped and much of the construction work that was in progress last year during the Centennial TT is now finished. I got settled into my corner of the press office as sidecar practice was just coming to a close, well past 8.00pm. The weather was pretty miserable: dull, wet, windy and only six solos had gone out earlier in the evening, one of them Italian Newcomer Alessio Corradi who did his mandatory first Isle of Man TT lap behind experienced competitor and rider liaison officer John Barton. Not the greatest of conditions to get your first taste of the Mountain course. The weather was pretty much what you would expect from the Isle of Man. Couldn’t have been nice out there for the sidecar boys but World Sidecar Champions and Isle of Man TT rookies Tim Reeves and Pat Farrance were second quickest at 94.00mph. Even more impressive was their Monday night 103.71mph lap which put them 12th overall in the dry. Nick Crowe and Mark Cox topped Monday’s timesheets with a 112.85mph lap on their Honda. Monday night’s practice was held in much better conditions with Guy Martin topping the superbike times with a 126.020mph, the best of some bloody amazing speeds so early in practice week. John McGuinness did 125.96 on the Padgetts bike and Adrian Archibald was third quickest clocking 125.86. Don’t rule Archie out this year on the TAS-built AMA Racing Suzuki that’s he’s running himself this year. 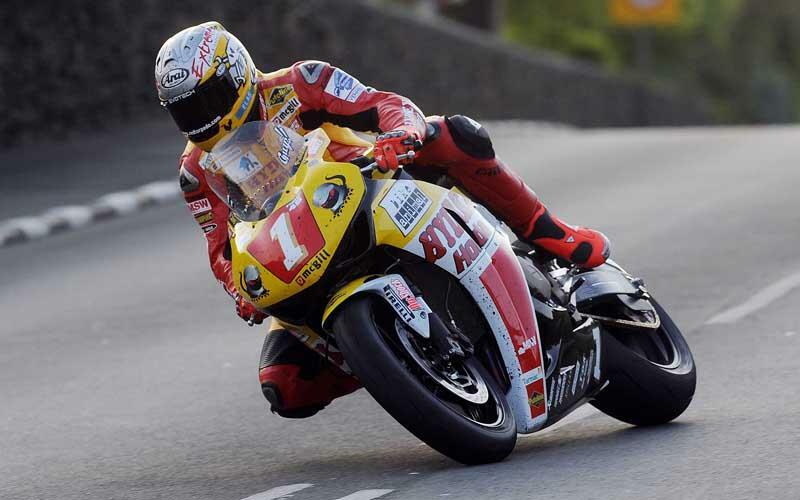 He had a duff North West but the Isle of Man TT’s where he really excels. Predicitably Bruce Anstey topped the Superstock times sheets on the Relentless by TAS Suzuki with a 125.94 and McGuinness was the fastest in Supersport with the Padgetts Honda at 122.60mph. Ryan Farquhar is riding his Kenny Harker Kawasaki ZX-10 superstocker in the superbike class as well. He split with the McAdoo team just after the North West so has no superbike and rather than try to pick up a ride with another team, he’s just racing the superstocker in both class. Who knows, the less fierce power delivery could actually work in his favour. He was sixth quickest on Monday night. The other top Irish team absent from the paddock are JMF Millsport. Their Isle of Man TT star Matin Finnegan lost his life at the Tandragee. The team bounced back when Alan Seeley won the North West 200 superstock race, but they have no TT rider. Late in Monday night’s session James McBride crashed in the high-speed Gorselea and sustained multiple injuries including a compound fracture to his arm, ribs and damaged his shoulder and vertebrae in his neck but is recovering in hospital. Today it’s raining steadily and the forecast isn’t any better for the evening when practice is set to start around 6.20pm after roads close at 6.00pm (5.00pm on the mountain). We’re hoping the weather will break – but we’re not holding out breath.